WST12 is the international universal heating electronic thermostat. 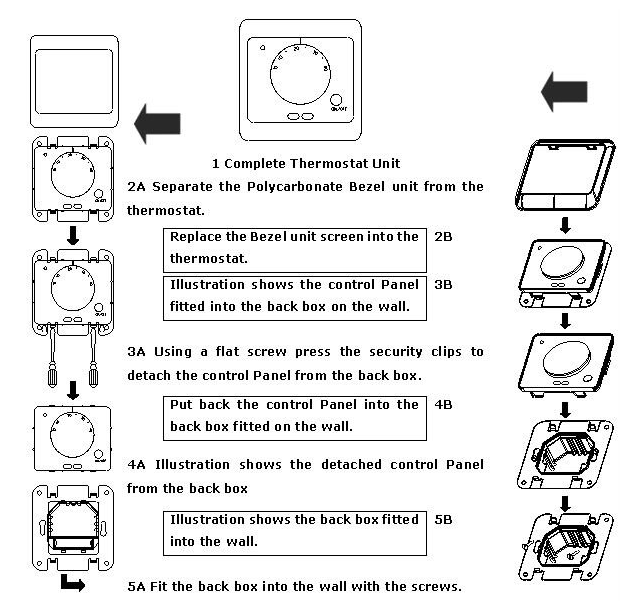 It use installation of direct wall and have a wide range of controlling temperature. Fool type control interface is easy to use. LED indicates the working state and it is easy for users to understand operation of the thermostat. It is applicable to the unserfloor heating system of the temperature automatic controlling and provides users with a comfortable, safe, energy-saving and high standard heating environment. Access to external sensors can realize double temperature double controlling (Built-in sensor measures temperature and external sensor makes the over-temperature protection).
. Installation location:To be fitted in the surrounding air to flow freely on the wall, shall not be affected by other heat effect(Such as sunlight, windows and doors airflow and wall temperature). The casing is buried under the floor, the sensor is arranged inside the casing, ending of casing should be thickened, and put in upper part of the concrete layer. Sensor cable can be instead of other cable to be lengthened to 50 meters. If the extension cable is used two of multi core cable, the rest of the cable can not be used for other equipment power supply (such as heating power cable) so as to avoid the voltage signal to disturb the thermostat. If the extension cable is shielded cable, shielding line should not be grounding. The best way is using independent extension cable and be arranged in a separate casing. Adjust dial to the temperature which need to be controlled, the controller will automatically track and compare the current environment temperature with the setting temperature. When the environment temperature is higher than the preset temperature, the thermostat will automatically disconnect the heater. When the environment temperature in the current is lower than the setting temperature, the thermostat can automatically connect with the heater.